One of my readers, for whose opinion I have the highest respect, suggested that this blog would be more useful to patients and carers if I were to be more honest about my feelings. I’m perfectly happy to do so but, of course, do not want to fill these pages with doom and gloom. That’s why I usually concentrate on the jollier aspects of life. It would be totally dishonest if I did not admit that I am anxious much of the time about my condition, most particularly, I suppose, in bed at night if the fasciculations are very active. One lies there knowing one is going downhill, but how fast? Beyond that I do not believe that I am seriously depressed. The worst aspect of this condition is the overall sense of weakness and increasing frustration in being unable to do things with one’s hands. Yesterday, for example, I almost failed to get out of the train because I could not exert enough pressure on the door â€˜openâ€™ button, which I eventually managed to do with my elbow. The other great frustration comes in handling paper. Sorting out files and so on and the absolute impossibility to grip single pages. I can still manage my laptop with my hands using the middle finger of my left hand to operate the mouse. In addition, I have a lever Point It! mouse, kindly provided by AbilityNet, which I also use. When the hands go I shall have to revert to a foot operated mouse which will also be provided by AbilityNet. Having said I manage with my laptop, again I find the process extremely frustrating. Everything is so much slower now. Beyond all of that I live day to day and do not give too much thought as to how I might end up. If I did well on this I’m sure I could become extremely depressed. It is for that reason that I include, in this blog, urbane details of unaccompanied visits to London, Lordâ€™s, the golf club and the like. Not to impress the reader about how sociable I am but just to demonstrate my physical ability for activity. I hope that this satisfies the reader who wanted to learn more about my emotional state of mind. My Forced Vital Capacity (FVC) – blowing into a little handheld device -was 10% down on last time, in the supine position. The support nurse did not think this was significant but she obviously was sufficiently concerned to say that I should perhaps go to Papworth Hospital for a more detailed check. I believe this test is one that indicates your overall rate of deterioration more accurately than any of the others. Having said that the doctor examined my tongue and told me that, at present, the disease was not attacking my throat, so I really don’t know what to think. One good thing that came out of assessment was that the doctor agreed there was a possibility I could still go to China in October. In other words, my flailing arms may not have completely given up by then. He suggested a further assessment in early September when a final decision can be made. A team of people came in to the consultation to look at the feeding device and appeared to be very impressed. They included a dietician, an occupational therapist, a physiotherapist, a lady running a hospice and the engineer. The frame still needs a tiny adjustment on the armrest but once that’s done I believe it might be possible to have it tested within the hospital itself and then perhaps trialled in an NHS care home. Enough boring stuff I think it’s about time I added another anecdote. With the Ashes starting next week (cricket against the Australians for those few people in the world who haven’t a clue what I’m talking about), I have added to Anecdotes The Cricket Match, which I hope you all find amusing. 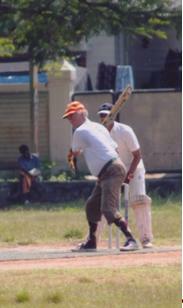 The first time I personally experienced leather on willow was on October 25, 2003 on the former military parade ground, Fort Malabar, Cochin, India – the first such match to be played on this ground since 1947 – that is Europeans against the local Indian team, the Cochin Cricket Club, dubbed by us for this game as the Kerala Killers, we being the Great British Geriatric Gentlemen. I should perhaps explain why and how we came to be in Kererla at all. The culprit was one Jeremy Richard Simon Brinton (pictured on my right below) who together with his delightfully crazy fiancÃ©e, Susannah Margaret Smith decided to get wed in St Francis Church, which boarders the northern side of the said military parade. The wedding ceremony caused a minor sensation, being again the first such since independence in 1947. The battery of television cameras, camcorders and digital cameras was worthy of Madonna. The bridegroom, having received acceptances from 55 or so guests from all corners of the globe, decided to round off the celebrations with the cricket match against the locals. This was a stroke of genius except that he failed to ascertain just how good and keen were these locals. He compounded the imbalance by having absolutely no idea what experience he could call on from his guests. Me for instance. 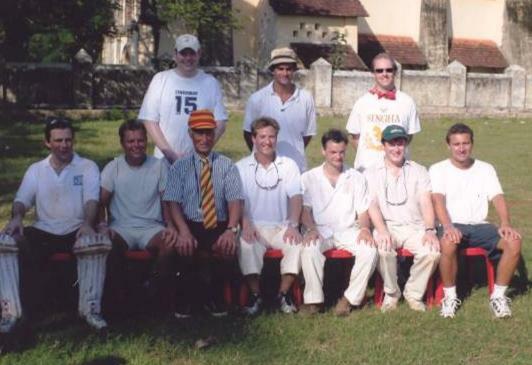 Although outwardly giving the appearance of being a seasoned cricketer – although to be fair I had never claimed to be such – being a very keen long-term MCC member, had never actually faced a ball in any form of cricket match in my life. Again some explanation is necessary as to how I had reached my 70th. year without having experienced the thrill of facing a bowler, who is intent on either removing my stumps or my head! The answer is quite simple. I was such a sickly specimen at school that I had a medical certificate, excusing me from all the physical exertion. The danger of being that the boots holding my feet to my legs would not be sufficient to prevent a severe strain should I trip up. The matter was only remedied after I left school, and my mother relented and allowed my tonsils and adenoids to be removed, which had apparently been poisoning my system for some years. 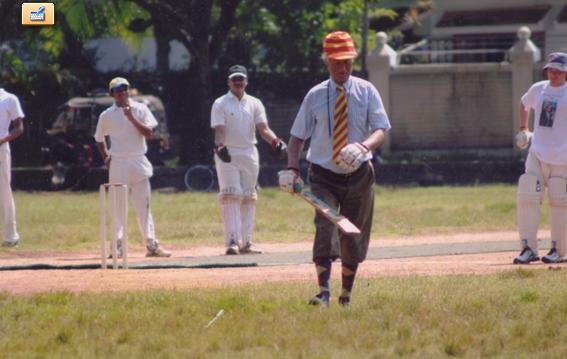 I was then able to indulge in sport, but alas, it was too late for cricket, certainly school cricket. 2. The Game shall be limited to 20 overs each side. 3. The Home Team shall not bowl medium or fast balls at any visitor over the age of 40 years. Any such ball bowled shall be signalled as a 6 for the Visitors, thus ( Y ) shall count as a â€˜no ballâ€™ from which the batsman cannot be out.. The Umpire shall be the sole arbitor of the speed of the bowl following an appeal by any member of the Visiting side. 4. The Visitors may rest or substitute any team member at any time and as often as they like.5. No batsman may occupy the crease for more than 4 overs and , in any event, must retire immediately he scores 30 runs but may return later to complete the 20 overs, provided no more than 9 wickets have fallen. 6. No member of the Home Team may score more than 2 boundaries per over. Any number over 2 shall cause the score of the Home Team to be reduced by 4 runs and be signalled by a circular motion of the hand above the umpire’s head. 7. No bowler may bowl more than 4 overs. 8. All â€˜throw â€“insâ€™ shall be under arm. Any deemed not to be by the umpire shall cause the offending team to be penalised 4 runs. 9. No batsman can be out first ball from any new bowler. In the event it proved necessary to add one more rule when we arrived, and inspected the ground, and noted and number of cows and kids grazing the outfield. 10. Any batsman who strikes a ball, which hits a cow or kid shall be credited with five rounds. Of course my objective was no more than the blindingly obvious one of wanting to give us a chance of putting on a reasonably good show! On the morning of the match I woke up in the Residency, on the south side of the erstwhile parade ground, to the shrill cries of excitable youngsters playing football on what was to be our cricket square. The football match ceased and the groundsman appeared to prepare the pitch. He brushed off the dust and rocks, disturbed by the footballers, using a bundle of twigs. The outfield was not cut but was being cropped here and there by the cows and kids which had prompted the late insertion of Rule 10. A wide green coir mat was then laid the length of the pitch and a handsome red posted pavilion with exotic drapes (shamiyana) was then speedily erected on the north side. Finally the groundsman circumnavigated the boundary which he marked with the trail of chalk dust. There then was the setting for the duel to come. St Francis Church to the north, Fort Malabar Residency to the south, the Cochin Club on the west side and some undistinguished buildings to the east. The Cochin Club is worthy of a further mention as it was here that we congregated for the reception following the wedding, with the bridal group being led in by a phalanx of noisy drummers. This club was clearly the smart place to come in the days of the Raj when I doubt that any member of the darker nation would have been allowed to cross the threshold other than in the guise of servant or waiter. Following the reception, and as we passed by open windows on the way back to the Residency, I observed a solitary quartet of four elderly Indian matrons playing bridge in a vast card room where once the white memsahibs would have sat, over half a century earlier. A little further on, through another open window, I saw the ubiquitous billiard table, now gathering dust and possibly rarely used where once, no doubt, it had been the focal point on mess nights, billiard fives and all that. An echo of times past, times remembered, fading inexorably over the decades until, if ever, another wedding party, or roving cricket team takes to the erstwhile parade ground to try their luck against the CCC, and then passing through the club, will see nothing but what they see. So much for the surroundings, what of the pitch itself? I was approached by what I took to be a journalist but what could equally have been a tuk-tuk (auto-rickshaw) driver, cricket enthusiast, asking if I could comment on the ground. I had no great difficulty in finding the bon mot, challenging, I said and then strode on leaving the enquirer to mull that over. In the event it was a fair description. Challenging indeed it certainly was. One third of the ground was hard baked mud, created, no doubt, by half a century of football games – organised, official and ad hoc. Somewhere beyond this mud flat lay the outfield, bare in parts or else covered by tall grass being grazed by the livestock (the lawnmowers!). The boundary ran through this variable surface marked by periodic chalk deposits, leaving it to the honesty of the fielder to swiftly assess whether ball had passed over an invisible line between adjacent chalk heaps some 20 feet apart – nothing as sophisticated as a third or fourth umpire for this match! Indeed whilst mentioning the umpires I should perhaps point out that we ended up with only one although there could have been a second one disguised as a fielder at square leg! The reason for the sparsity of umpires was that all balls were bowled from the St Francis Church end, for whatever reason I never discovered. As there were no lbwâ€˜s allowed, at least for the visitors, the other umpire was kept busy signalling no balls and leg byes and boundaries as well as the confusing new signals indicating runs to be the deducted from a team which infringed my special Rules. In the event when it came to indicating such transgressions the umpire had his own hybrid signal of four runs to be deducted, an action more akin to a tumble-dryer that had suddenly gone berserk rather than the circular motion of the hand above the head that I had suggested. The scorers, who had all the enthusiasm of the bearded wonder, were understandably confused from time to time and to this day I’m not certain that they ever really faithfully recorded what the umpire was attempting to signal. Where the patches of lush outfield occurred even a well-struck ball had little chance of piercing the boundary and twice the match was in danger of being abandoned altogether through loss of the only cricket ball in this thick grass. The wicket, as I said, had been covered with a six-foot wide green, coir matting. This had the effect of highlighting the erratic undulations, particularly at the batting end. It occurred to me afterwards that perhaps the home team were not so compliant and accommodating as I had originally thought, indeed possibly quite the opposite. Having received a copy of our rules beforehand I suspect that they had decided to impose Rules of their own in order to swing back the balance. In this case to make us receive from one end only — the end with all the lumps and bumps with which, no doubt, they were all pretty familiar. I should perhaps have listened more carefully when the home captain innocently informed me that we must bowl only from one end. I had brushed this aside without really listening and without realising that this may have been the classic two upmanship ploy – i.e. how to be one up on a oneupman (shades of Stephen Potter). To round off the scene I should perhaps say a little more about the splendid temporary cricket pavilion which would have gladdened the heart of many a hospitality consultant on an English county cricket ground. Four stout poles were erected supporting a sloping, highly decorative linen or cotton roof – ostensibly this was there to protect us from the sun although in reality it created a furnace below it when compared with the shade of the nearby trees were the semblance of a breeze managed to wiggle in. Beneath this canopy and surrounded by highly colourful and decorative cotton sheets were bright red plastic chairs generally speaking reserved for members of the paler nation. The bulk of the locals disported themselves, again many on red plastic chairs, or on the grass, under the shade of the adjacent trees. Seated at the eastern end of this canopy and pavilion were the two scorers who took their duties immensely seriously and whose anguished cries rang out from time to time â€˜who is the bowlerâ€™? Did I mention that the temperature was nearer 30Â°C than 25Â°C and heaven knows what degree of humidity, but certainly high. Indeed, it may well be that this high humidity saved the life of at least one or more of our alcoholically pickled visiting team some of whom I saw consuming a perfectly good bottle of Chivas Regal only a few hours before they snatched two to three hours sleep ahead of the onset of this great match. Thus was set the scene for the fierce battle to come. The home team were immaculately turned out in whites whereas the visitors, excepting myself, were a motley crew in shades of white and grey with trousers of variable length and bagginess. 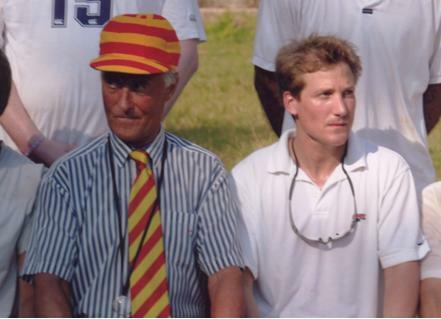 As the doyen of the visiting team, in terms of age at least, I bedecked myself in a 1920s style brightly hooped MCC cricket cap with a new MCC tie to match. My existing tie being too badly stained from the Bolly of many seasons at Lord’s, not to mention the occasional dropping from an odd curried egg roll. My lower half was clad in plus fours or more correctly plus twos, as they were rather longer in the leg of than plus fours, crowned below between trouser and shoe with my best harlequin coloured socks, sadly not available in MCC colours. Thus adorned the spectators could have no doubt who was the self appointed but, believe me, reluctant, figurehead. All decisions between captains, scorers and umpires being referred to me. I suspect that the word was out that I was some ancient giant of the game, probably dating from W. G. Grace’s era, and thus to be deferred to on all occasions. Goodness knows who they thought I was, probably even they did not know but nevertheless the authoritative (and as you, dear reader, are aware and they were not) yet totally inexperienced air, was sufficient for their purpose. So to the match itself. I had already determined that we must bat first and therefore win the toss. Dutifully, I spun a rupee coin. Our captain called tails. The coin, now resting on my left hand and carefully concealed by my right, not showing any of our gracious Queen’s profile I took to be tails and so declared without protest. Had the home team being put in first I envisaged they would have exhausted our hungover wedding party by batting through the entire 20 overs knocking up an impossibly high score which we, as visitors, would have no chance of surpassing. My way round this dilemma was to get our 20 overs in first and then the home team I assumed would quickly knockoff our miserly 20/30 rounds, which I anticipated, incorrectly as it turned out, would be all that we would muster. If I was correct in my analysis our agony would not be prolonged too long under the intense heat of the midday sun and we could all adjourn, at a respectable hour, to the nearest hostelry for well-deserved sustenance. Our captain bridegroom opened with his best man James Grant-Morris. This pair acquitted themselves very well in the 4 overs allotted to them. The captains scoring 10 runs from 13 balls before he was run out and young James, holding up his end well, adding a modest 4 runs to the score, having faced 12 balls. It was then all change. The two fresh batsmen Fraser Slater and Bromley Oldfield taking the field. Fraser lasted only 7 balls before he was caught. Bromley, on the other hand, played a magnificent innings retiring, not out, after his allotted 4 overs, with a handsome score 41 runs from 31 balls. Then another wedding guest Jeremy Kilpatrick took the crease and scored a creditable 15 runs from 15 balls before being caught in the slips. Graham Millar was next stumped after 11 balls having scored 5 runs with Mark Taylor caught in the cover with 2 runs to his name after 6 balls Alistair Castle and James Exelby were next in both facing only 2 balls before the long trudge back to the pavilion. Alistair managing to break his duck before he was caught and this James unfortunately did not, before he was clean bowled. At this point of the game we were 120 for 7, which I considered to be a very respectable score, certainly far in excess of my most optimistic expectations. I had elected to bat at 11 but captain, in his wisdom, decided there was at least one person likely to be less competent than I, so put me in at 10. I disdained the greying frayed, mismatched pads which the home team had kindly provided. Anyway pads and plus twos are not sartorially comfortable with each other. I would have liked a cricket box but this was a piece of very personal equipment not provided and not the sort of thing that one would think to pack. Whether or not any of our young men had secreted the protective equipment into their own underpants and were too sensitive to offer to pass this lifesaver from sweaty crutch to sweaty crutch, I know not. All I know that I was to take guard unprotected in the vital area. Accompanied by wild cheering, both from the pavilion and spectators from under the shade of the trees, it was announced, to the delight of the crowd, that â€˜Professor Mark Cato age 70 will bat nextâ€™. I was not 70 years old but nearer 69, however six score years and 10 sounded much better than 69 in publicity terms. So 70 it was. An innocent enough hyperbole considering the event, the day, the setting and the crowds excitement on hearing that someone twice the age of the next youngest visitor was going out to bat. Our team ranged in age from late twenties to mid-thirties and the home team, barring the ageing captain – late forties early fifties – ranged from 15 years old to mid-twenties. I strode to the wicket, heart pounding, with the cheers of the crowds echoing encouragingly in my ears. 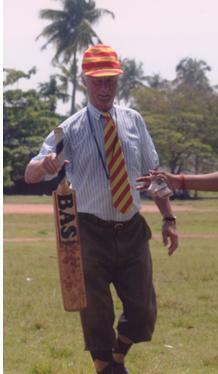 My partner was our captain who had come in again, having retired earlier under Rule 5 after 4 overs. This time he added a valuable 15 runs to our score. Suddenly I was facing my first ball ever. Firstly, I took guard, a comic sight already or at least eccentric. I played to the gallery. After firmly planting my monocle in right eye I asked for middle and off. How to mark the spot? The coir matting, with its wobbly chalk line marking the crease, by now almost obliterated, making runouts and stumpings very questionable, helped me not at all. The wicket keeper ultimately coming to my rescue by deposited a pile of chalk dust in roughly the right spot. The wicket, as I said, had been covered with a six-foot wide green, coir matting. This had the effect of highlighting the erratic undulations, particularly at the batting end. It occurred to me afterwards that perhaps the home team were not so compliant and accommodating as I had originally thought, indeed possibly quite the opposite. Having received a copy of our rules beforehand I suspect that they had decided to impose Rules of their own in order to swing back the balance. In this case to make us receive from one end only — the end with all the lumps and bumps with which, no doubt, they were all pretty familiar. I should perhaps have listened more carefully when the home captain innocently informed me that we must bowl only from one end. Remembering 60% weight on the front foot, I reminded myself, straight bat, don’t hang it out dry and be ignominiously caught behind or in the slips as I have witnessed so many times at Lord’s. Due to my advanced age it was decided to bowl to me underarm, kindly meant but nevertheless an insult, but who was I to argue! The first ball, which was free, in as much as by Rule 9 I could not be out from it, shot across the coir matting at the speed of a giant Anaconda intent on snatching its prey. It went by so fast that despite all of my skills as an erstwhile polo player, able to strike a moving ball from the back of a galloping horse with a flimsy 52 inch stick, I was unable to get anywhere near this fast moving target with a stumpy bat half the length of my polo stick. In fact, I was surprised at how heavy was the bat. Thus, my dream of an opening boundary was shattered. After a plea from me the bowler reverted to normal overarm but the moment had passed. I chipped at the next ball outside the off but not far enough to risk a single. I then had to change ends with my captain, it being over. J. B. struck a couple of spirited blows which left me huffing and puffing up and down the pitch as we garnered more runs. After another over I was on strike once again. I managed a couple of mildly copybook shots, both of which were non-scoring, before I let loose with a fine blow straight into the safe hands of long off. I trudged back to the pavilion, defeated but not bowed, to the wild cheers of the assembled crowd. My first game then was over, well almost. Later, when we were fielding the captain used Rule 4 literally to ensure that I did not have to spend too much time in the field under the fearsome sun. With a duck to my name I wonder if this qualifies me to join the Radio 4 Primary Club – I must drop an e-mail to Blowers. The match continued and far from being skittled out in half a dozen overs the gallant Great British Geriatric Gentlemen continued to build an impressive score, 129 for 9 before their 20 overs expired. I will draw a veil over the home side’s innings but suffice it to say that at one stage it looked as though we might win. It became quite clear to me that the alcohol was wearing off and our young men had their tails up. They could see a win in sight. This would have been totally unacceptable under the circumstances, particularly as we had seriously knobbled the home team with our special Rules. So serious were our team that they even refused to allow the versatile young bride Susie from bowling which she was very keen to do. I sent out clear instructions to our team that they were definitely not to win. Whether or not this had any effect at all I cannot tell other than to say that there was a very satisfactory conclusion when the home team passed our score in their 19th. over. The traditional cricket tea took place in the Malabar House Residency â€“ samoosas and rather thicker than normal cucumber sandwiches. Shades of the Raj still. Some things never change. Thank the Lord. To celebrate my 70th birthday, one of my cricketing friends from Lords, John Fawkes, wrote and declaimed the following tribute to that match. Make of it what you will! He couldn’t bat, he couldn’t bowl and he couldn’t field at all. 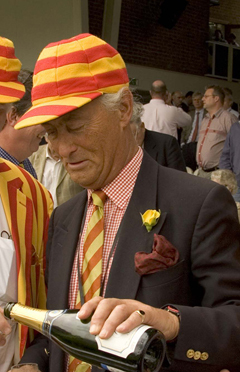 But he loved cricket and many years ago, you see His love was requited: he joined the MCC. Evan when it rainedâ€” he would always appear. Supporting England, hosting guests, enjoying the scene Drinking champagne, smoking agars, always very keen. Now a learned Professor with absolutely no cricket gear. It was so far away it seemed rather a pity. For these Indian Celebrations promised the best. And moreover the groom had challenged the Local Cricket X1. The temperature was at 30 C so Mark rested under a tree. The home team was restricted in the runs each could score. They could only bowl 4 overs eachâ€” but nothing more. The Indians seemed to be under his spell. They agreed to him being the rules making boss. They even agreed when he fiddled the toss! But batting in the heat was sweaty as hell. Waiting at No. 9 for his cricket destiny. The crowd cheered; a rousing tune came from the local band. Middle and off he said and thought the wicket looked hard. And they even managed to synchronise calls. But Mark once again faced the foe. No, sadly the ball was caught quite brilliantly at ‘Deep Mid-Of. Back to the pavilion he trudged defeated but not bowed. A duck in his ever first cricket game. It really was a terrible shame. Now to bowl out the home opposition and in good lime. Made it hard for the home team to contemplate winning! The Indians were nearly beaten at one critical stage. But Mark intervened as the wise old sage. But the goodwill created obviously appealed. For the locals cheered Mark’s team off the field. And so ended Markâ€™s short lived cricket career. Which did not start till his 70th year. He can talk about playing in India far away. No longer an onlooker and for a very small sub. He can now join ‘Blowers 4 Primary Club. let him now take heart. I was absolutely amazed yesterday when I checked on the statistics for the blog and found that there have been around 25,000 hits since April 16th. There were 10,000 or so requests for pages presumably for people reading the diary or the anecdotes. I did give the blog some exposure when it started, through my various contacts, at home and overseas but it is still an amazing statistic. I expect the novelty will soon wear off. Some of the people who have accessed the blog probably came through the MND Association or the Cancer Association, both of whom have included a 500 word profile of me on their respective web pages. In addition I joined patientslikeme.com, at the suggestion of my MND team leader, and completed a profile which I hope will assist other sufferers. Again, I suppose that there have been some hits as a result of that. I do advise anyone with a serious illness to use this â€˜patients like meâ€™ webpage as it can provide a great deal help and support from persons suffering from something similar to yourself. My wretched power shower packed up a couple of days ago, but good old Derek, our plumber, will have it back in action again in a day or two. The point being that with my disability I really rely on this rather than the bath. Incidentally, I tried a bath a couple of weeks ago, during the very hot spell ( our summer! ), while Alice was in London. It was a hot day and I was sweaty and thought it might be rather fun. Unfortunately I found I could not get out, despite struggling for up to an hour. I managed to swing my legs over the side but all the twisting and turning was without avail, I was simply too weak to lever myself out I even let the water out in case I landed on my face and drowned. I did panic a little as Alice was in London until late afternoon and this was lunch time. I had visions of her arriving home and finding me sitting there, blue with cold, probably hypothermic, and subsequently being ticked off like a small child. Fortunately I had taken the mobile telephone up with me and managed to reach it by the side of the basin. I dialled the directory enquiries for my neighbourâ€™s telephone number and found her in. Even more fortunately her son was with her and he popped over and hauled me out. I never told Alice. She would kill me if she knew but as she never reads this blog she may never know, leastwise, until I am beyond being ticked off. Reverting to the shower, I should perhaps mention that the only reason I can continue to wash myself is by using a 3 foot long handled sponge. A cheap and useful device which I can recommend for anyone in my position. Not a great deal has happened since my assessment on 2 July. Although I still spend eight or nine hours a day in the office most of it seems to be on the computer, answering or sending e-mails; dealing with correspondence; updating my blog; editing my autobiographical notes etc. (this week with one ear to the radio listening to the first of the Ashes Test matches, in Cardiff). Talking of cricket I do hope you bloggers have read my latest anecdote, The Cricket Match. There always seems to be a backlog of things to do. I did go to London on the 3rd. to lunch with my stockbroker; walked round the golf club on the following Monday (with the geriatric crowd – Tuesday becomes Monday sometimes when there is a match which interferes with the normal arrangements); I attended the Arbitration Club in London on Tuesday and tonight we are going to the first of two dinners, very kindly being given in my honour, ostensibly for services to arbitration. So life is not entirely dull. What a lovely dinner we had at Peterhouse College last evening â€“ the oldest college in Cambridge, founded, in 1284, by Hugo de Balsham, Bishop of Ely. It was a candlelit supper which made life a little difficult in reading my speech. I wondered whether this was the only remaining college in Cambridge not to have electricity in the dining room but I think that one is Magdalene College, Cambridge, where son Miles went. Indeed, I recall him telling me, some years ago, about an American visitor who marvelled at the beauty and history of the College (amongst other things it houses Pepys diaries) and could not understand why they were not able to afford electricity in the diving hall! There was a good turnout for this dinner and I saw many old friends and their wives. The deputy president of the Chartered Institute of Arbitrators, Joe Behan, and barrister Tony Bingham, made some flattering remarks about Alice and me before I gave my own offering which seem to go down quite well, even the old jokes. The committee very generously gave me a pair of silver champagne flutes and a decent bottle of champagne to go with it — you see how my penchant for champagne has spread. I blame Graham Morris, the Times photographer, for the photograph he took which has appears four times in that paper (and in Wisdon) of me pouring champagne at Lordâ€™s. Indeed the same cropped picture used for the blog. As I feared at least four of the guests, at the Cambridge dinner, that I know of, intend to appear again at the Atheneum at the end of the month and one of them pleaded with me to include at least one new joke. I shall oblige; it will be my favourite one which they have, no doubt, heard me tell over the years, however I am banking on the human frailty of â€˜long term cognitive impairmentâ€™ (memory loss) and hope that they will, at least, forgotten the punch line. Despite the late night in Cambridge I managed the early start necessary for me to get a lift to the golf club for my weekly walk around with the geriatrics. My legs are still working reasonably well, if somewhat more leaden than they used to be. I cannot say the same about my hands and arms, they really do get weaker by the week. The right hand, although it started going downhill much later than the left has been far more aggressive, the fingers are like jelly, cannot be straightened and are beginning to curl towards the palm. The wrists in both hands are weak and I really need the wrist splint on my right hand in order to lift a spoon, cup or glass to my month. (A straw for drinking has become a useful adjunct.) The only digit which still works reasonably well, and which I can straighten, is the forefinger on my left hand – useful for prodding the laptop. Adjusting heavy bedclothes is becoming impossible with my hands, elbows and legs taking over. Washing in the shower has become more difficult, I can only really manage by dint of the long handled sponge. I can still raise my hands to head height, with bent arms but cannot straighten them, so things like washing my hair or brushing it has become difficult . I manage reasonably well in the office, largely through voice activation, once â€˜my lovely’ has plugged in my laptop, but handling papers and lifting, even medium weight, books is difficult. AbilityNet kindly provided me a seven hole USB stand so most of my equipment can activate it by just plunging this stand into the laptop. On the lavatory front I am pleased to report that the miracle of the AUS continues and I am able to pee normally, my main difficulty being adjusting my dress afterwards. However, there is usually a friend who is prepared to accompany me and do the necessary or, for example, at Lordâ€™s I was able to enlist the assistance of one of those splendid St. Johnâ€™s Ambulance brigade. On the whole I find people extremely kind and generous and prepared to help although, wherever possible, I try to avoid asking anyone to put their hand in my pocket for my mobile phone, wallet, or whatever and generally carry them loose in a large linen bag, which makes them more accessible. I suppose the overall prognosis is that I am getting steadily weaker, week on week, but once up and dressed can manage to lead a relatively normal life with a little assistance here and there, provided I do not fall over, – which I have done once or twice – and then find it almost impossible to get up unaided. So on the whole I would say that my lovely wife and I are managing, but for how long? The Osbourne family, Nancy, Brian and twins Kate and Tom – now unbelievably almost 18 – came for a garden lunch. The weather was relatively kind and the family managed to battle it out on the croquet lawn in the afternoon. Sadly, I found it too difficult to wield the mallet as I always used to enjoy the competitive challenge of the game. The event we had all been looking forward to, the second Ashes test at Lordâ€™s. This, particularly so, following England’s dramatic draw in the first of the five test series, at Cardiff last week. This match at Lords too proved to be as immensely exciting with England winning, in the end, by a handsome 150 runs but not without doubt creeping in from time to time that the Aussies might turn the tables on us and win. The highlight was captain Straussâ€™s knock of 165 and â€˜Freddyâ€™ Flintoffâ€™s five wicket haul, which he achieved in the most nail biting fashion possible. With four wickets to his name and with the last ball in his last over ever, at Lords – having announced his intention of retiring from test cricket after this series – he failed to get the fifth wicket only to be told by the umpire that it was a â€˜no ballâ€™, giving him one more â€˜last bowl. With this ball he got his wicket and thus fulfilled a lifetime ambition to get his name on the hallowed board in the player’s dressing room. The stuff of â€˜Boys Ownâ€™ annuals. This win was all the more remarkable in it being the first test win, against the Australians, at Lords since a few weeks before I was born, in 1934. One up and three to go. Can we repeat our 2005 triumph and win the Ashes back? Off to Bwlch Uchaf, our Welsh cottage for a week. We stopped en route, in Church Streeton with my mother and Richard, we fed and watered them and left after breakfast on the Tuesday morning. I must say apart from my mother’s early onset of Alzheimer’s, which is barely noticeable, for a couple of nonagenarian’s they both seemed in remarkably good form. Wales greeted us with its usual mixture of rain, wind and sun – with more of the former than the latter – ensuring that my bathing costume stayed firmly in the drawer. Chloe and the grandchildren were staying at Grannyâ€™s house in Aberdovey, so there were many excursions to and fro. The joy of being a grandparent, however, is that one can always call it a day when things become too frenetic. The highlights of this holiday were those intermittent periods with the family, walks, beach and games with for the children; an evening dinner excursion up the beautiful valley to the Tal-y-Lyn hotel, nestling alongside that large dark sinister lake, beloved of a local fisherman and the visitor alike. Yesterday, â€˜my lovelyâ€™ and I spent the day in Machynellth (having originally intended to go to the art exhibition, the National Library of Wales, in Aberystwyth but due to the car playing up prudently opted somewhere nearer home). We had a jolly time visiting the antique shops, where we bought a beautiful piece of Welsh porcelain; had lunch in the Wynnstay Arms Hotel (gone slightly downmarket since the Colonel used to take the family there for lunch, admittedly over 50 years ago, but then things tend to change rather slowly in Wales) and ended up viewing the latest art exhibition, at an offshoot of The Museum of Modern Art of Wales, next to the Tabernacle. Contemporary art generally is not to my taste but there were one or two exhibits I could have lived with. After a week of relatively â€˜niceâ€™ weather, by Welsh standards, we set off back to Clavering, staying with the old folk in Church Streeton, on the way, following the now â€˜ cast in concreteâ€™ procedure. Champagne at six (I always arrive with two bottles — one for the upward journey and one for the return) and an early meal at a local pub.